We will not surrender to the FCC. On February 26th, the Federal Communications Commission (FCC), acting under the direction of President Obama, will vote on a 300-plus-page rule regulate the internet in much the same way it currently regulates utilities. The FCC’s new powers will be broad, and mark an end to the decades of unregulated internet service that has proven to be the greatest source of economic growth and innovation the world has ever seen. That the Commission will vote to pass the rule is all but a certainty. This is grim news indeed for those of us who value a free and unregulated internet. Nevertheless, it would be a mistake to assume that the fight for internet freedom is lost. 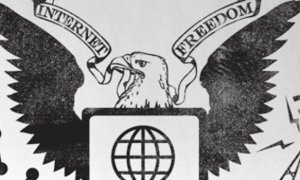 There are still two major avenues to block the FCC from carrying out Obama’s plans for a government-regulated internet. The first option is judicial. As soon as the new regulations are published in the Federal Register, lawsuits will emerge to challenge them. Until then, it’s important to keep the debate alive, educating the public on the dangers of a government-controlled internet so that the courts realize that people are upset and being impacted by this issue. Court decisions have already struck down the FCC’s previous attempts at regulating the internet on multiple occasions, so there is hope that they will do so again as long as we can keep the public conversation going. The second option is legislative. The FCC is claiming this new authority by interpreting the Telecommunications Act of 1996. Since the law was written before the internet was in common usage, it is ambiguous in how, if at all, the internet can be regulated. A simple amendment to the Telecommunications Act could clarify this question, and kick the legs out of the FCC’s and Obama’s proposal. Language to do this already exists. A short and simple bill introduced by Rep. Latta (R-OH) would specifically classify internet service provision as an “information service” rather than a utility, thereby exempting it from utility-style regulations. Of course, Democrats in Congress would never go along with a standalone bill like this. In the minds of many on the left,even Obama’s plan doesn’t go far enough, and there would be no reason to compromise with Republicans now that they are on the brink of victory. Still, this does not mean that Congress is helpless. With the new Republican majority, albeit not filibuster proof, language like that of the Latta bill could be attached to a budget resolution, or as a rider to some other must-pass legislation. This would then put the Democrats in a position of having to choose between forcing a government shutdown, or restoring the internet to the way it has always been - free. These are discouraging times for the champions of internet freedom, but now more than ever it’s important that we not give up, and continue to make the case against Obama’s internet takeover.